FROM I-81: Take Interstate 81 To Exit 42. Take NYS Rte 177 East To West Lowville. Turn Right Onto County Rte 29 ( West Road ) Proceed Approximately 7.8 Miles To NYS Rte 26. Turn Right OnTo NYS Rte 26. Proceed 1.4 Miles. 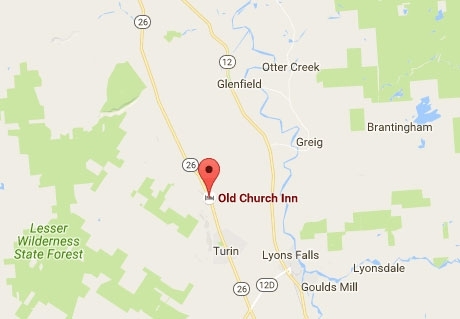 The Inn Will Be On The Left Side Of The Highway. FROM SYRACUSE: Take Interstate 90 East To Exit 33. Turn Right Onto NYS Rte 365 North. Proceed For Approximately 6 Miles To A Point Where NYS Rte 26 Intersects Rte 365. Continue North On Rte 365 & Rte 26 For Approximately 3 Miles Where You Bear Left Onto NYS Rte 26 North. Continue On NYS Rte 26 Approximately 35 Miles To Turin NY. Continue On NYS Rte 26 Approximately 3 miles Past Snow Ridge Ski Resort To Houseville NY. The Inn Is On The Right Side Of The Highway Across From Marty's Country Store. FROM ALBANY: Take Interstate 90 West To Exit 31. Turn Right Following The Signs To NYS Rte 12 North. Proceed North On NYS Rte 12 Approximately 31 Miles To Boonville NY. Turn Left Approximately 0.3 Miles Past The Burger King Restuarant Onto NYS Rte 12D. Proceed North On NYS Rte 12D Approximately 9 Miles To A Flashing Yellow Caution Light. Go Straight Through Light Proceeding Approximately 3 Miles On NYS Rte 26 North To Turin NY. Continue On NYS Rte 26 North Approximately 3 Miles Past The Snow Ridge Ski Resort To Houseville NY. The Inn Is On The Right Side Of The Highway Across From Marty's Country Store.